Hi! 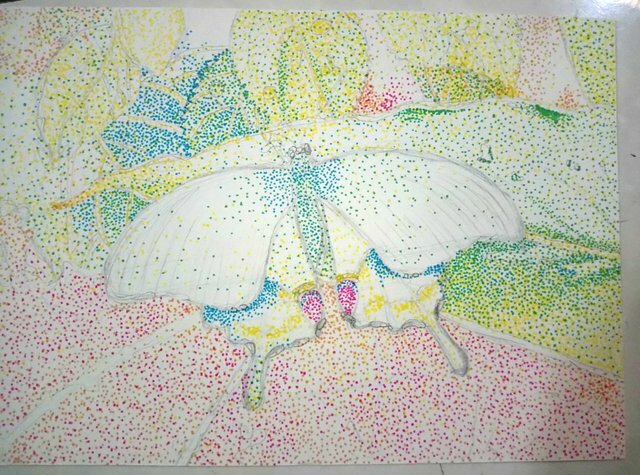 I want to share my dotted butterfly today and introduce you its technique. When I get tired, I rest, I do other things and continue it on the next day! And you don't need a patience if you start it with a small piece, smaller than A4. I did this in A5 size. 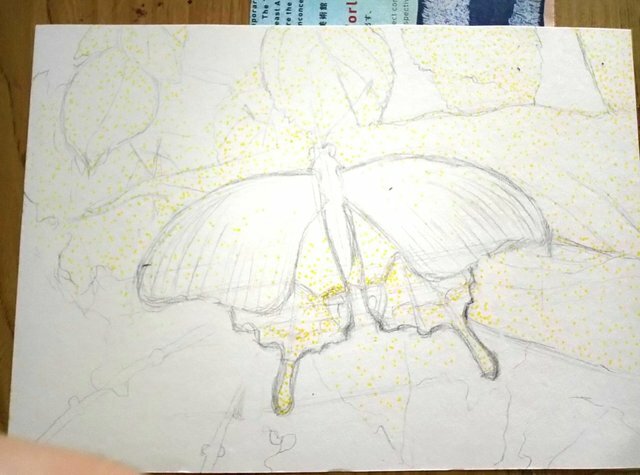 Okay, but not the bumpy ones like watercolor paper, I think you might have difficulty getting the ink into crevice. And if you have one of these pens? These rotring and technical pens are very cool but choose not so small ones. 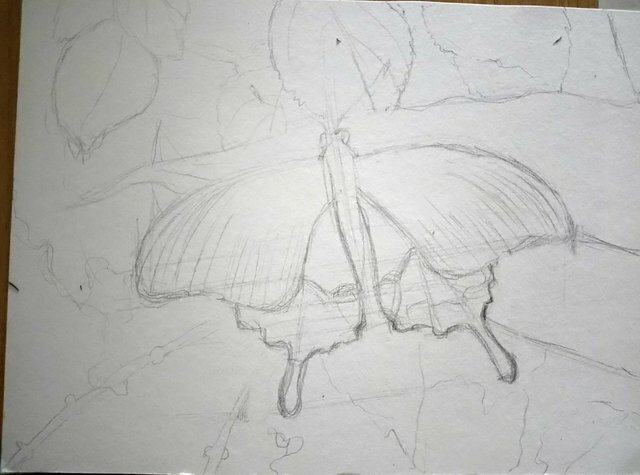 Long time ago, once I did with 0.05mm pen from Sakura, I only did a size of my palm because it wouldn't be done. 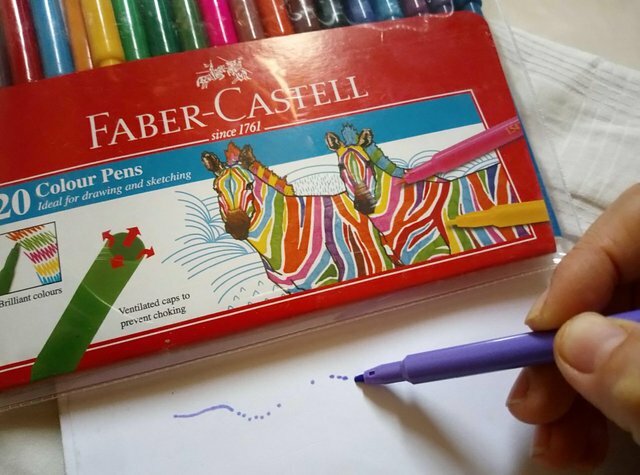 If you want try for the first time, find a marker pens like these. I am using this 20 pens set, very affordable and just the right size, and enough colors. You will need something to refer on. I used my own snap shot photograph, and magazine pictures before. If you prefer to use your sketch illustration, that's also good too. Draw the lines lightly with pencil. And make sure you mark the area to be white because the white would only come from the color of white paper. I avoid these area to leave them white! Sorry I can't stop this gif😅. 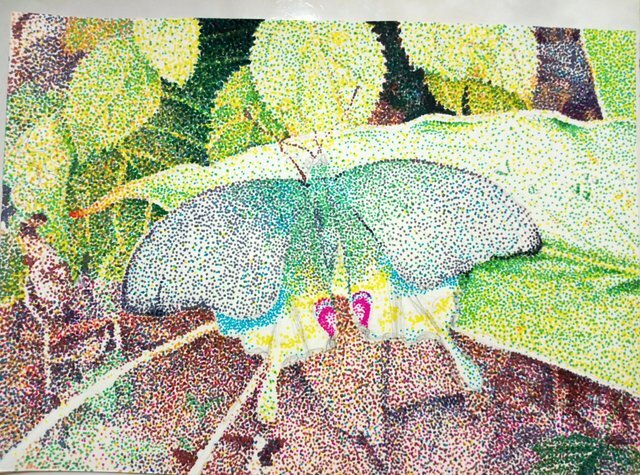 As you could see, it goes from light dots to dark dots. 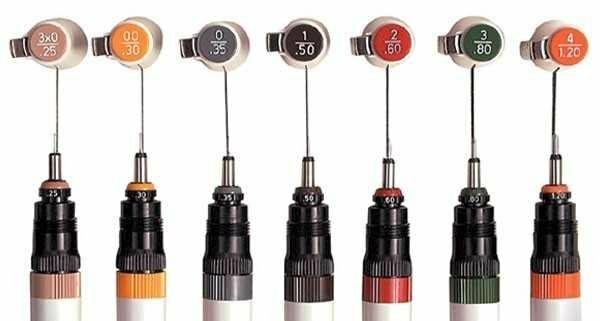 Go over your pens, and find the lightest color of all!! I go with yellow first. There are many yellowish green leaves. Then light orange for the background and some leaves. Then lot's of yellow green. Since I can't erase darker shades, I think of it as adding a layer every time you change to darker pens. 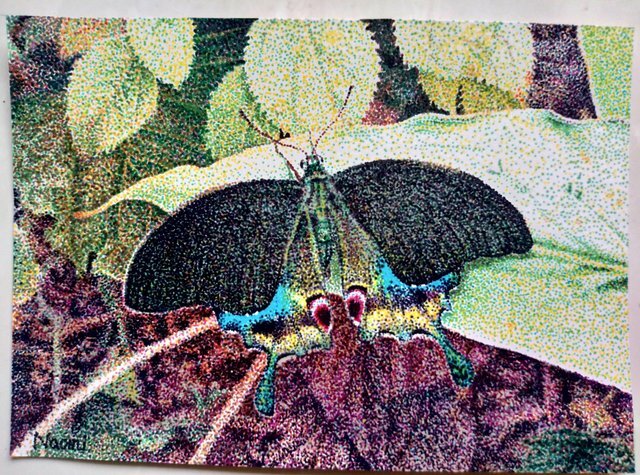 Okay, so the most important skill in doing this are not only dotting, but also applying a color blend and constantly comparing. The yellow colors are there because the leaves did look yellow. 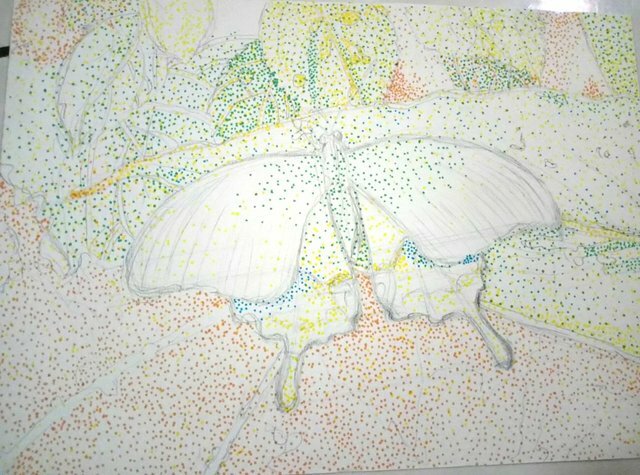 And I also applied yellow and light blue to geen leaves. When yellow and blue coexist, from a distance, eye percieve it as green. 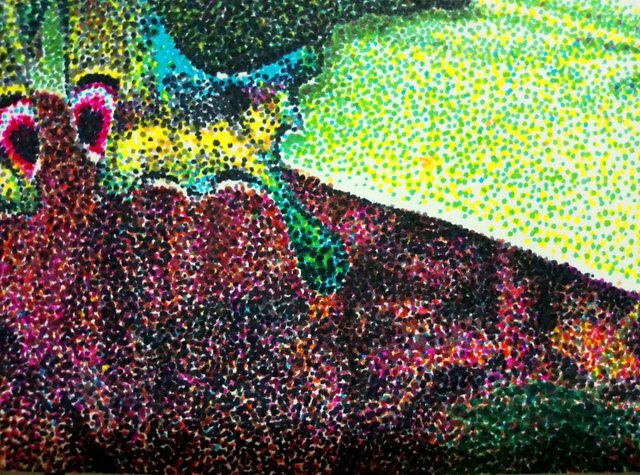 so also added green dots to smooth it out. 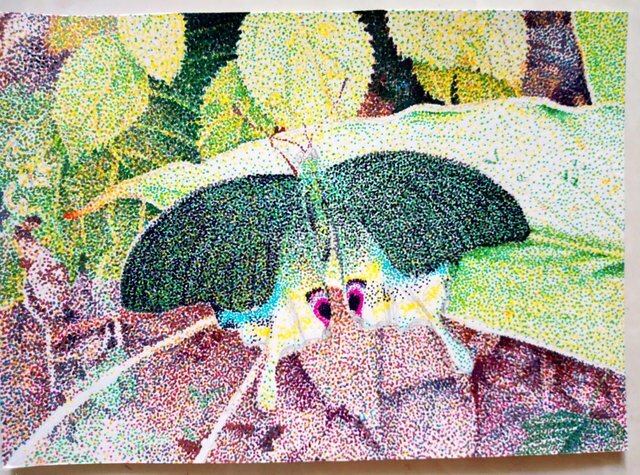 This method is always been used throughout my pointilism. 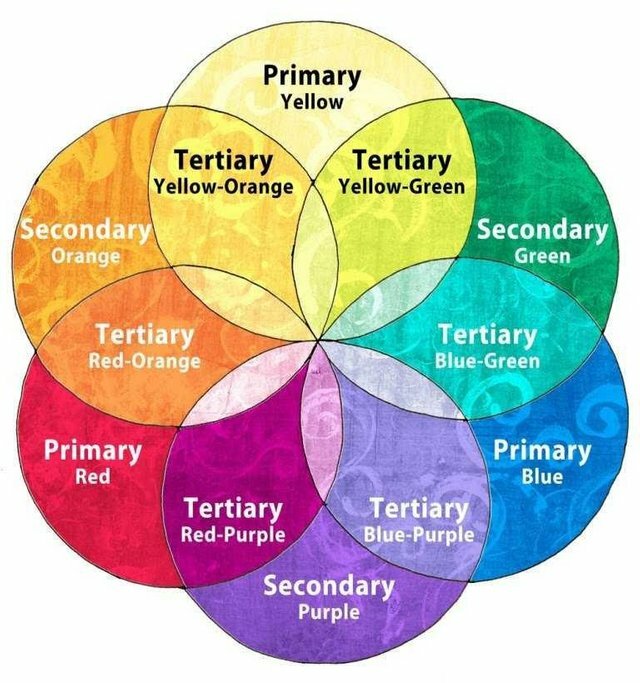 So this color wheel is very handy! For the background, I added pink. Here is a close up when its done. You won't really see the pink any more. It's buried by darker ones and could only see the glimps of it, just enough to give bright color punch! Here I added gray and grass green. Constantly comparing means "is this green enough?" and check my photo. "is this darker than that leaf?" and make it more darker. Gray on the wing wasn't dark enough, so I started using black from here. Finally!! Keep working adding dark colors and black. Still could dot bright and light colors for adjustments. Done it in about a week. All the work and images which doesn't have source written are done by me, @naomipangolin. 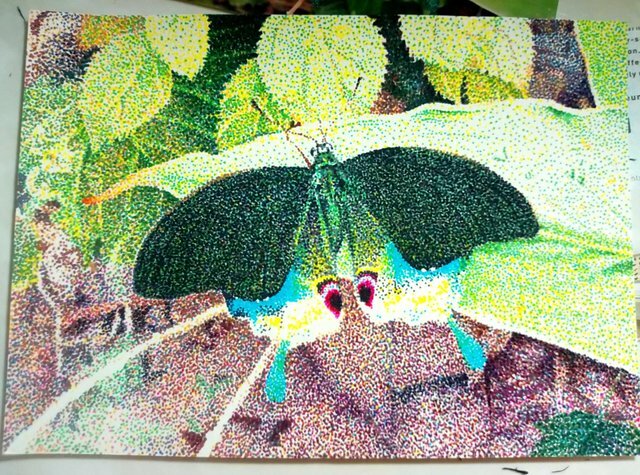 Thank you, I am finally done @artzone! 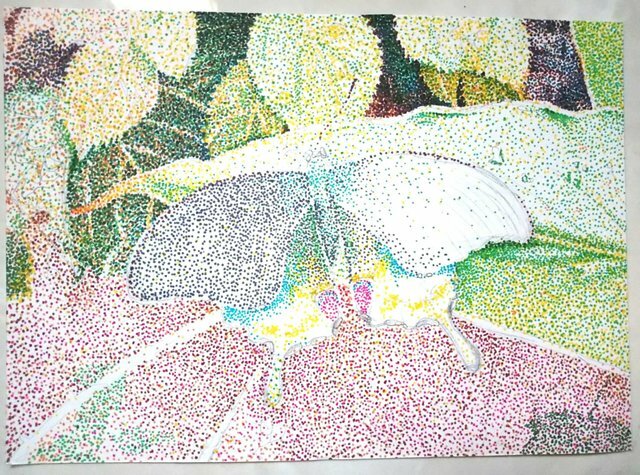 Lots of dots... I mean hug and love to you! 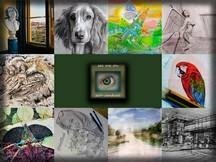 Wow, thank you @art-venture! You are making magazine? I go check it now! Thanks @veryspider, always motivated and feel support from you!! Cheers!!! 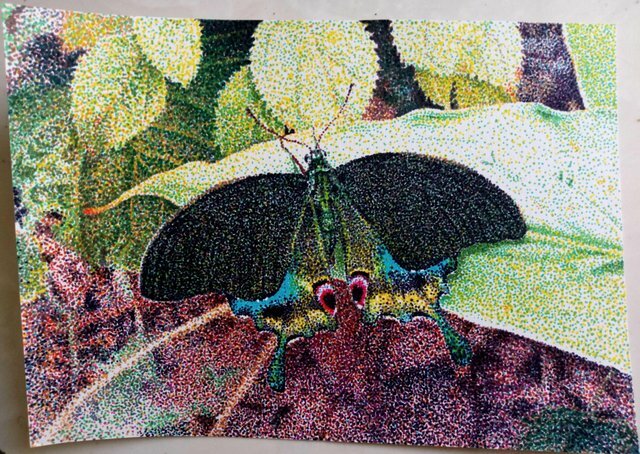 So pretty @naomipangolin :) Love the effects of pointillism. Do you prefer this method compared to painting? I love how realistic the art piece look. Its like when we used the old printer type with low resolution printing quality. 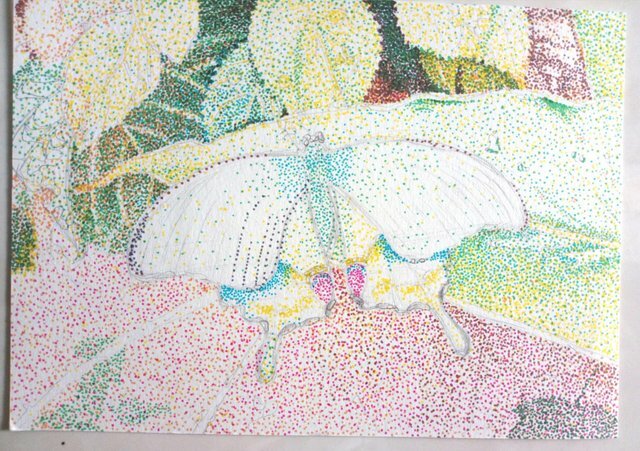 Actually if you use bigger paper and smaller pen, those dots will be less noticeable. Takes forever though.... I do more for exhibition so see how it goes!! 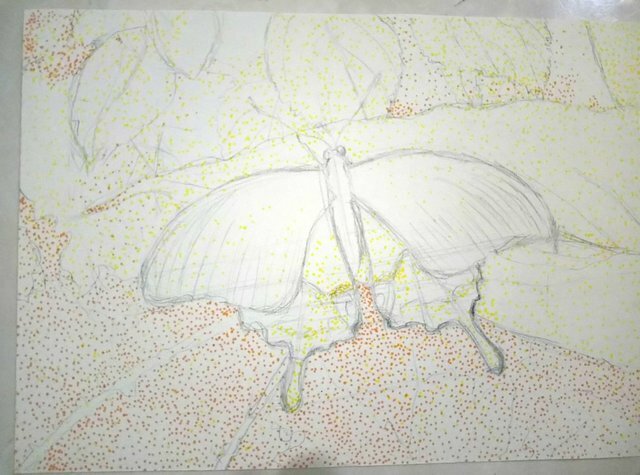 @naomipangolin,.😍😍 i love it so much.. you now upgrade the marker pen hehehe.. i still use the economic marker pen you shown last time 😜 I still practice and it was a mess everytime.. I guess my weak point was the dot too big, i pressed it too hard. It looks so light and innocence!Especial complimenting you about the gif idea!